My friend Laxman knew better than most of us what bullying was. His father worked in Pahalwaan’s fields, a small time landlord of our town with a penchant for bullying people dependent on him or weaker. Pahalwaan also ran a tea shop. The tea shop was the place, where grown up people of our locality met and talked. When Laxman was 13, Pahalwaan asked his father to send him to work in his shop after school. Laxman’s work was to wash dishes and server tea. Seldom, we would go to the shop to meet Laxman. Due to the work, he had become irregular in the playground where we used to play in the evenings. Many a time, we saw Pahalwaan and other bullying Laxman. Pahalwaan would hold his ears and role them. ‘ye dekho Ganapati ka chuha’, one day we heard him mocking Laxman. Often, we too would become part of that regular dose of fun. We were too young to understand how Laxman was taking it. Later, we too started doing the same with Laxman. The tallest and the heaviest of us would caught hold of Laxman’s ears and make him Ganapati. We would laugh holding our pants. Those giggles cost Laxman too much. He started avoiding us. One Monday, the day Pahalwaan kept his shop closed, Laxman didn’t come to play. For he was the most sought-after player, the curiosity was obvious. When his absence became regular, we knew something was wrong. One Monday we went to meet him in his house. We found him playing with his sisters. He couldn’t convincingly tell us why he stopped coming to play. He just said that he had lost interest. Sometimes after, he left school too. His father told our teacher that Laxman cried every time he was told to go to school. Soon we forgot Laxman. I don’t know how is he now but I know that it was bullying of Pahalwaan and us that took him away from us. Who knows what he would have become had we not bullied him? After all he wasn’t lacking anything. Only thing that had saved us from suffering the fate of Laxman, perhaps, was that we survived Pahalwaan’s bullying. By bullying Laxman, Pahalwaan had set a trend. He had made Laxman a clown for others too. Now there is no Laxman in our town but Ganapati. Often people see him dancing in the processions against crowd cheering, ‘wah Ganapati, shabash’. I have lived and relived Laxman a thousand times. His fate is a realization for me what bullying can do. It breaks children’s confidence. In India, there are many Laxmans who are bullied every minute for sadist pleasure of mentally sick people. 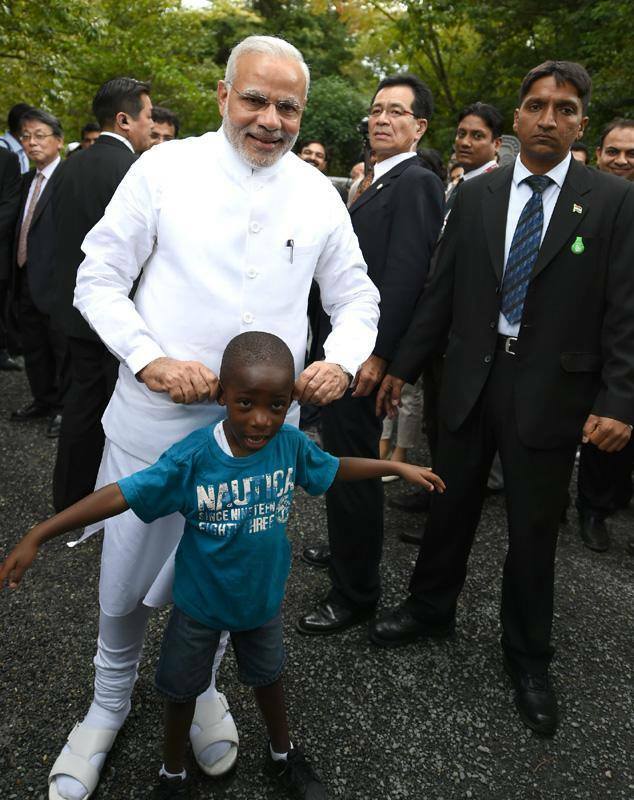 When PM Modi, held the ears of the boy in a temple in Japan and made fun of him I was taken back in time. I saw myself standing in front of Pahalwaal’s shop watching Laxman being bullied. Although, it was happening seven seas far, I could recognize everyone there. I saw Raju chacha, Hari bhaiya, Vinod, Abhishek and I laughing aloud. Laxman too was laughing but has tears in his eyes. I know, like then, this time too he won’t forgive me. This entry was posted on September 1, 2014 at 7:46 am	and is filed under India. Tagged: India, Narendra Modi, Narendra Modi in Japan, PM Modi, Vishnu Sharma. You can follow any responses to this entry through the RSS 2.0 feed. You can leave a response, or trackback from your own site.